At Monster Displays we have had the privilege of working with thousands of brands as big as global enterprises and as small as local mom and pop shops. But we are especially happy when we get to work with a company so dedicated to helping those in need. Today we put the spotlight on a valued client with a huge body of work produced through us. 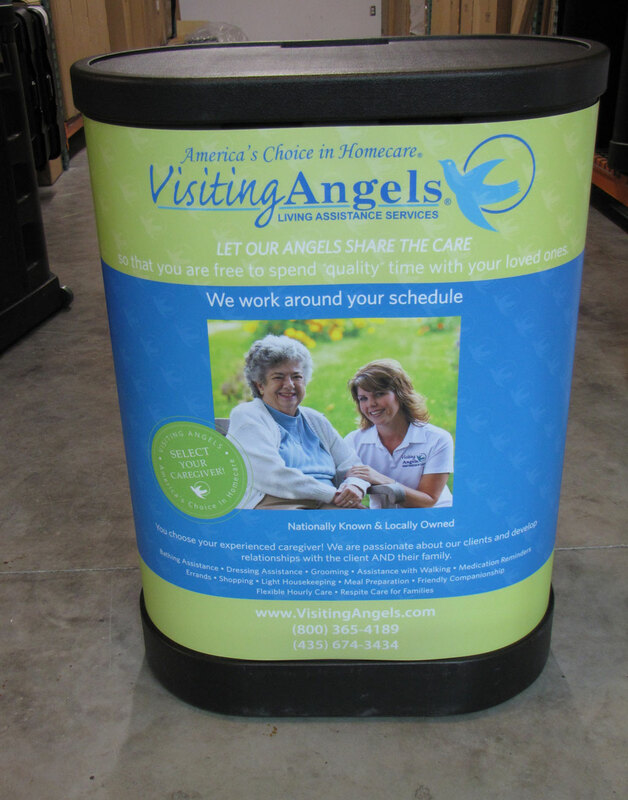 From table covers to retractable banner stands, Visiting Angels franchises throughout the country have trusted in the consistent quality and excellence of our advertising aids. The collaboration started more than five years ago, where a strategy began that offered Visiting Angels cost-effective, visually diverse and versatile marketing solutions through Monster Displays. 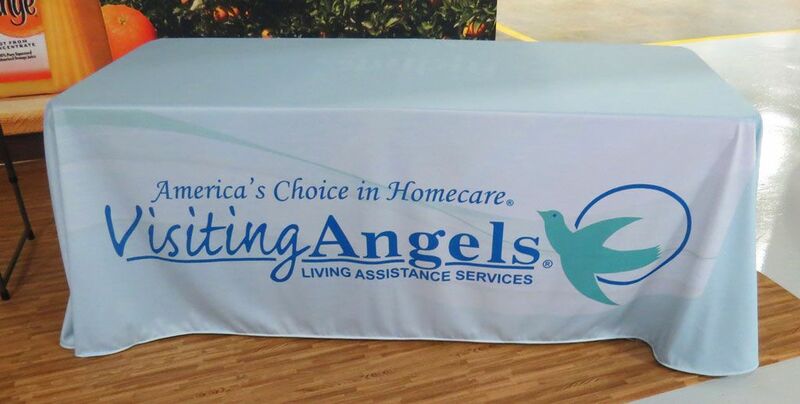 We have proudly produced hundreds of banners, pop up walls and table covers to help the Angels brand spread their mission of compassion throughout the nation. Come share in our journey! Visiting Angels is a national, private duty network of home care agencies. They are proud to be the nation’s leading provider of non-medical senior home care services. 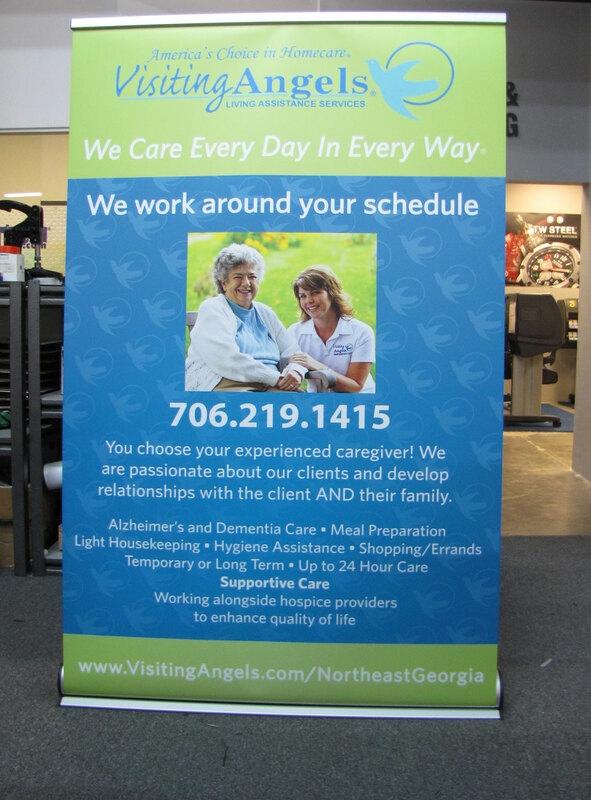 Angels provide in-home care, elder care, respite care, senior personal care, elderly care and companion care services. With senior home care services, elderly adults can continue to live independently in their own homes. When you choose Visiting Angels as your elder care provider, you will enjoy proactive senior home care services that are focused on the needs of your loved one. Their elder care services are designed to put you in control. They don’t dictate your schedule or try to adjust your habits to meet their needs. Instead, their job as caregivers is to adjust to your routine. Their caregivers do everything possible to keep you safe and comfortable in your own home. The mission was to create a catalog of hand picked exhibition signage that fit into each franchisee’s budget, keeps set up simple and allows for versatility. 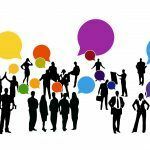 When developing marketing for various locations with individual branch goals and challenges, it is important to offer options for them to communicate to their audience in a way that fits each voice. The resulting collaboration of design and vision has given Visiting Angels franchises a selection of displays in varying size with multiple art choices. This gives them the ability to customize representative names and locations in the art so that the production process can remain smooth, fast and hassle free for each franchisee that contacts us. Let’s have a look at some of the most popular combinations they use to get more exposure. These products are chosen for their great portability and versatile curb appeal that fits into any budget. One of our most popular selling displays of all time, the 10ft Curved Pop Up offers excellent brand exposure and informative visibility. Using a sturdy Aluminum “accordion” frame and laminated HD Inkjet photo mural panels for protection, this is a go-to exhibitor kit that is surprisingly easy to set up. An example of how utilizing different art can adapt the focus of your marketing between shows. This allows the same frame to be used again and again, maximizing the return on investment. This case goes together with our 10ft Energy Pop Up like peanut butter and jelly. Your kit fits snugly into this hard case with wheels so you travel with the confidence that your precious display will arrive safely. A very popular banner stand for its low price point. You get the same HD Inkjet, laminated graphic. This design focuses on information and makes for a good freestanding solution. A sturdy banner stand with telescoping pole and HD Inkjet laminated graphics. 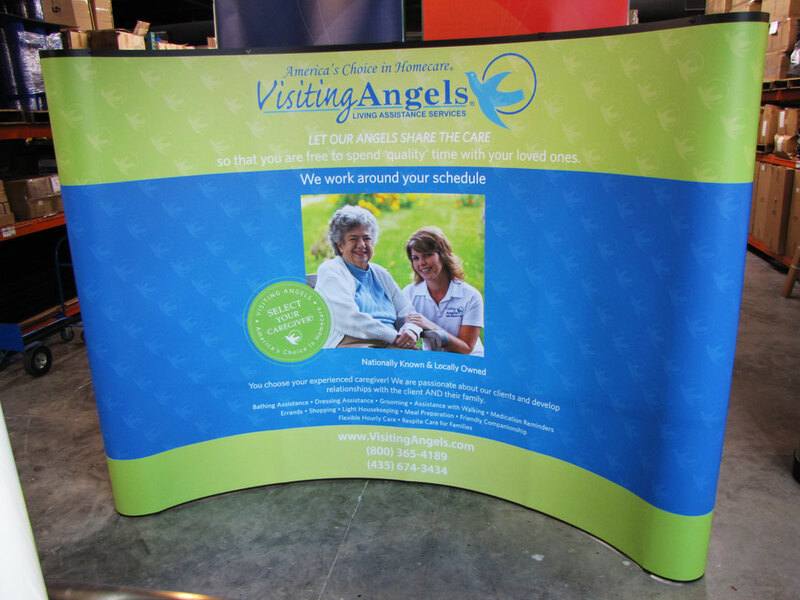 This classic low cost, durable and easy to set up marketing solution has great curb-appeal for your booth. The bigger brother to our widely used 36″ banner stand. This model offers more graphic and messaging exposure, for when your banner is intended to be a prominent piece of your standalone marketing. 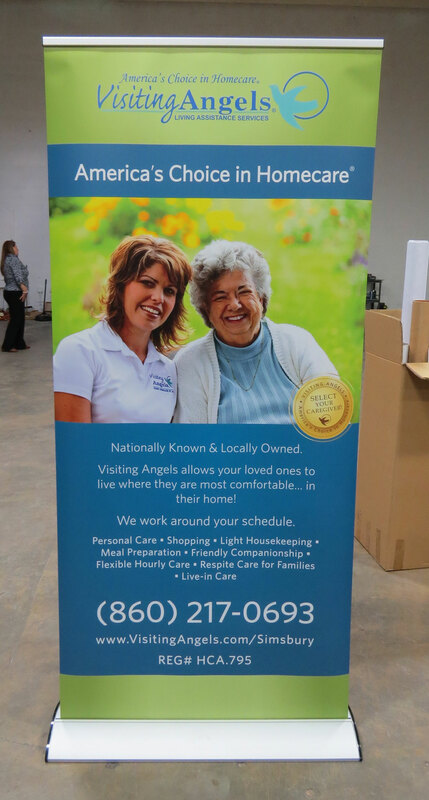 A premium upgrade version of our 36″ banner stand. It features a heavy duty frame with a broader profile for added stability. This convention favorite is an essential part of any booth. Like other retractables, it comes with a telescoping pole for adjustable height. The second most popular product that the Angel’s marketing team equips in their utility belt is the tried and true table cover. Our full color dye-sublimated table covers are all made in our Miami production facility from 100% USA made Polyester fibers. The fabric is wrinkle free resistant and flame retardant compliant nationwide. Its knit has a smooth finish that gives your graphics that vibrant shine.This convention favorite is an essential part of any booth. Low cost, lightweight and durable; your trusty branded table covers are a great addition to your portable marketing tool box. There are huge advantages to a parent brand setting up franchise-wide agreements with us from a customer and production perspective. Coordinating ahead of time to configure different art templates and textual standards becomes an invaluable time saver. Each local rep just calls us up with what they need, chooses their art and their display gets fast tracked into production. Visiting Angels’ parent multimedia team has worked with our designers to streamline the process for individual branches. What begins as 2D art can then be translated into a 3D rendering that gets as close as possible to the final product. 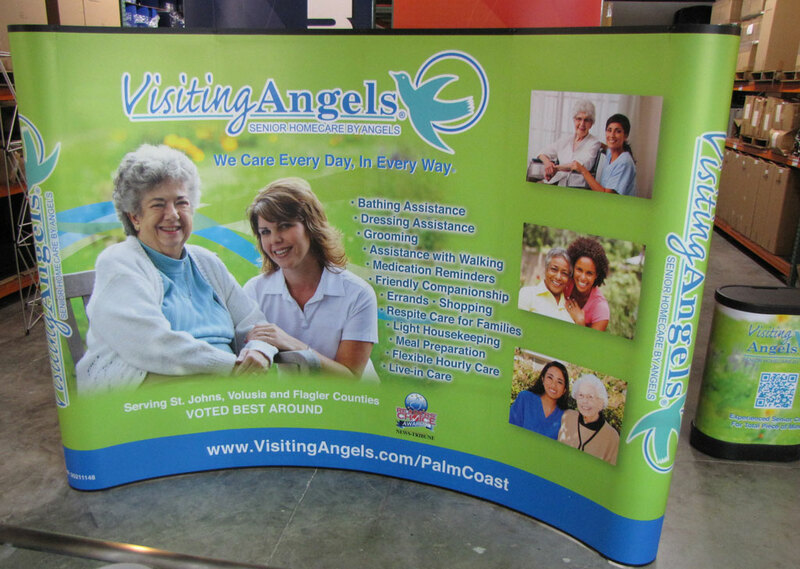 Establishing these standards and proof approved art ahead of time allows Angels’ franchise locations to easily call us up with little background and select from our pre-approved art and product choices like the above 10ft curved pop ups, banner stands and table covers that fit nicely into most marketing budgets. We have always found that the success of our clients is as important as our own. To this effort we have happily gone beyond production and helped with the presentation of options to the branches. As a full service print production house, we specialize in professional graphic design and art proofing to ensure the final visuals look great every time. We have been able to offer services like flyer design to share with and help inform franchisees as well as dedicated landing pages that group all of Visiting Angel’s discounted products in one place. 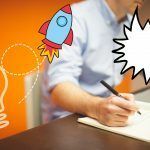 These visual aids can be invaluable when introducing a large group to new marketing collateral. “Ok, I’m impressed. Give your designers a Scooby snack for knocking that one out of the park..
We hope you enjoyed this inside look at how we support the volume of display needs for Visiting Angels brand. From concept to order it has been a fulfilling collaboration. We are happy to be able to provide these care givers with our service.